Jaime leads out and Jaime raises, Jaime 4-bets all in for 26,000 more and Jaime calls. Jaime has AQ and Jaime has 66. Jaime catches a 6 on the flop. Jaime catches a 6 on the river. 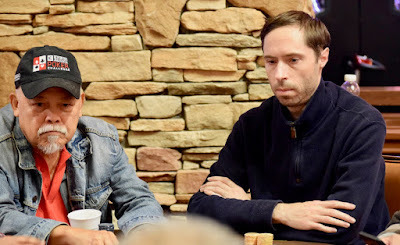 Rones (left) v. Haletky (right), all-in preflop. There's a 6 on the flop, another on the river, quads for Jaime against Jaime and Jaime doubles through Jaime.